Thank you for your offering last weekend which totalled £571.90. Attendance was 220. 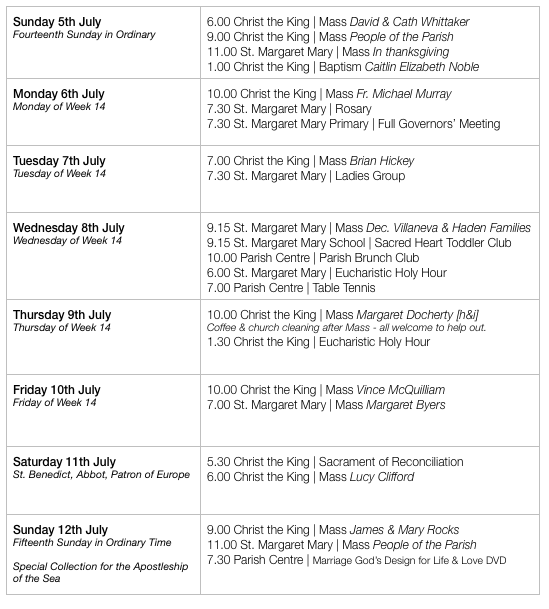 The weekend of 15th/16th August marks the 60th Anniversary of the opening of Christ the King Church [opened for the celebration of Mass in 1955 & consecrated in 1956]. To mark the occasion, there will be a Shared Lunch and Open House in the Presbytery Garden from 1.00 pm on Sunday 16th August. Sheets are available at the back of both churches: simply put on your name, what you’re bringing [to avoid 500 bags of crisps]. Please make an effort to come along! If you’re willing to help organise the day and jolly people along, please let Fr. Michael know. Donations of bottles of Prosecco to toast the occasion will be gratefully received between now and then. There will be a formation day at Our Lady & St. Joseph’s on Saturday 24th October 2015 beginning at 1.00 pm led by Fr. Peter Groody. Could all extra-ordinary ministers please attend. More details to follow. If you are interested or know someone who is interested in becoming a Roman Catholic, an informal group will be formed in October to explore the richness of the Catholic Faith. Contact Fr. Michael for more details or a chat. Is now on a break for the summer. It is a good opportunity to familiarise children with the normal celebration of Mass and the discipline of attentive listening during the Liturgy of the Word - sitting young children near the front of the church also helps. At the elevation of the Sacred Host and Chalice, parents are encouraged to make their children aware of what is happening. There will be a training day for the Sacristans of the parish - those who help get things ready for the celebration of Holy Mass or other sacraments on Saturday 12th September at Christ the King beginning at 1.00 pm. Volunteers are always needed for this important ministry - please see Fr. Michael for more information. The diocesan pilgrimage to the shrine of Our Lady at Cleator is on Sunday 6 September. Mass and blessing of the sick begins at 3.00 pm. Bishop Brian Noble will preside and preach. Teas will be provided in the Civic Hall, Cleator Moor CA25 5AR, £8.50 per head. Bookings must be made by contacting St Mary’s Priory, Cleator on 01946-810324. Cheques payable to St Mary’s, Cleator. Deadline: 24 August. Young people are invited to walk in pilgrimage from Castlerigg Manor, Keswick, to Cleator, beginning Friday 4 September. Details from Fr Philip Connor - 01768-772711. Thank you for your offering last weekend which totalled £665.92. Attendance was 213. 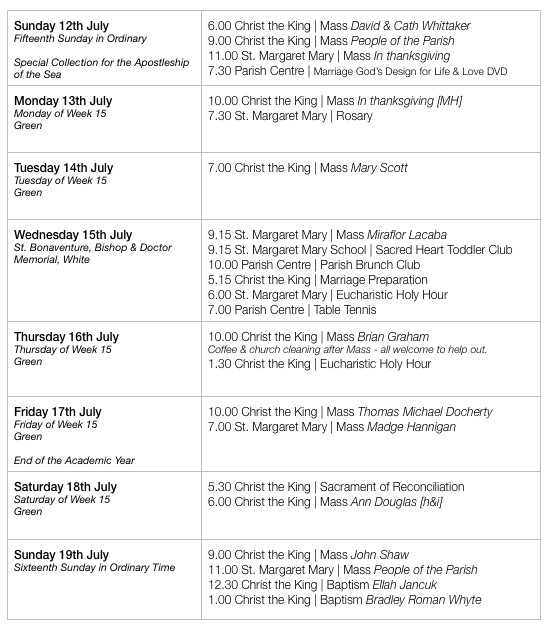 The weekend of 15th/16th August marks the 60th Anniversary of the opening of Christ the King Church [opened for the celebration of Mass in 1955 & consecrated in 1956]. To mark the occasion there will be a Shared Lunch and Open House in the Presbytery Garden from 1.00 pm on Sunday 16th August. Sheets are available at the back of both churches: simply put your name, what you’re bringing [to avoid 500 bags of crisps]. Please make an effort to come along! If you’re willing to help organise the day and jolly people along, please let Fr. Michael know. Will be celebrated in May 2016. The formation of candidates will be organised on a deanery level and will be held at Newman School. As well as attending these sessions, candidates will still be expected to participate regularly in the celebration of Holy Mass in the parish. More details will be published in September. There will be a training day for the Sacristans of the parish - those who help get things ready for the celebration of Holy Mass or other sacraments - on Saturday 12th September at Christ the King beginning at 1.00 pm. Volunteers are always needed for this important ministry - please see Fr. Michael for more information. Come and join in the fun at our Noodle Night at St. Margaret Mary Parish Community Centre on Tuesday 11th August at 7.30 pm in aid of Sr. Madeleine’s Project in China. Adults £5 Children £2. All welcome. Young people are invited to walk in pilgrimage from Castlerigg Manor, Keswick, to Cleator, beginning Friday 4 September. Details from Fr Philip Connor on 01768-772711. Thank you for your offering last weekend which totalled £715.80. Attendance was 229. Information about the issues, together with resources and guidance, will be circulated to all parishes in the next week or two. I strongly urge all Catholics to contact their own MP as soon as possible to express their concern about the dangerous impact which such a Bill would have on the most vulnerable people. MPs do listen to their own constituents. What is needed is more and better palliative care, not assistance with suicide. Is on its summer holidays until September. However, for more information, call Laura - 07551671522 ore email: littlemoonbeams@hotmail.co.uk. The marriage of Kathryn Allan and Craig Miller is proposed to be celebrated at St. Margaret Mary on Saturday 8th August at 1.00 pm. If you are aware of any lawful impediments to the proposed marriage, please inform Fr. Michael as soon as possible. Will meet on Thursday evening at 7.30 pm in the Parish Room at Christ the King. There will be a day course for members at Our Lady & St. Joseph’s on Saturday 21st November between 1.00 pm and 4.00 pm - all members are asked to attend this. The day will be led by Fr. Peter Groody. celebration of this sacrament should be made in person to Fr. Michael following the celebration of Holy Mass on Saturday evening or on Sunday. Will be celebrated in May 2016. The formation of candidates will be organised on a deanery level and will be held at Newman School. 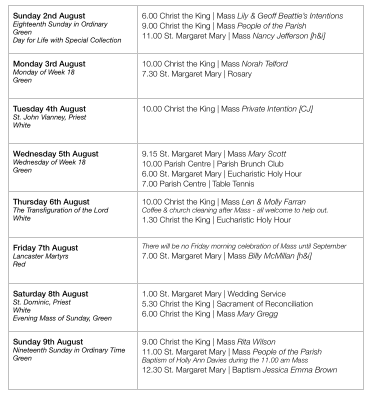 As well as attending these sessions candidates will still be expected to participate regularly in the celebration of Holy Mass in the parish. More details will be published in September. There will be a training day for the Sacristans of the parish - those who help get things ready for the celebration of Holy Mass on other sacraments, on Saturday 12th September at Christ the King beginning at 1.00 pm. Volunteers are always needed for this important ministry - please see Fr. Michael for more information. 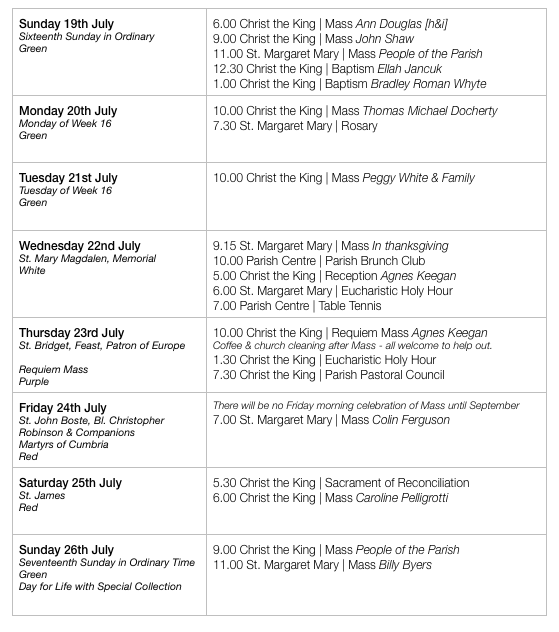 The weekend of 15th/16th August marks the 60th Anniversary of the opening of Christ the King Church [opened for the celebration of Mass in 1955 & consecrated in 1956]. To mark the occasion there will be a Shared Lunch and Open House in the Presbytery Garden from 1.00 pm on Sunday 16th August. Sheets are available at the back of both churches: simply put your name on and what you’re bringing [to avoid 500 bags of crisps]. Please make an effort to come along! If you’re willing to help organise the day and jolly people along, please let Fr. Michael know. Donations of bottles of Prosecco to toast the occasion will be gratefully received between now and then. Thank you for your offering last weekend which totalled £576.11. Attendance was 231. This DVD [43 minutes long], which presents the Church’s authentic teaching on marriage and family life will be screened in the Parish Centre this Sunday, 12th July at 7.30 pm. In light of the forthcoming Synod on the Family, being held in Rome in the Autumn, it is a worthwhile exercise to come along and watch. Information about the issues, together with resources and guidance will be circulated to all parishes in the next week or two. Copies of a sample letter to send to John Stevenson MP are available at the back of both churches but your own letters would be better. Wednesday 10.00 am - 2.00 pm and Sunday 12.00 noon - 3.00 pm. For more information contact the centre manager, Trevor Tiffin, on 524295. On Wednesday mornings at St. Margaret Mary School 9.15 am - 11.30 am - 50p per child. All parents and carers welcome - children welcome from birth. Refreshments and snack provided. No booking required. For more information call Laura - 07551671522 or email: littlemoonbeams@hotmail.co.uk. Experience the beauty of the Lake District and support our diocesan Youth Service. The Manor is open for bookings from groups, individuals, and families, 17–31 July & 2-10 August. B&B just £25 per adult; reduced rates for children and teenagers. For more information, or to book, please contact Gillian on 017687-72711. The final class for this year will be this Wednesday 15th July at 5.15 pm in the parish room at Christ the King. Pope Francis’ new Encyclical Letter "Laudato Si" on environmental issues, our place in creation and responsibility towards our common home is available in Christ the King Church library. More spiritual and biblical books can be found in Christ the King Church parish room. Our small library is free and you can keep a book as long as you need. 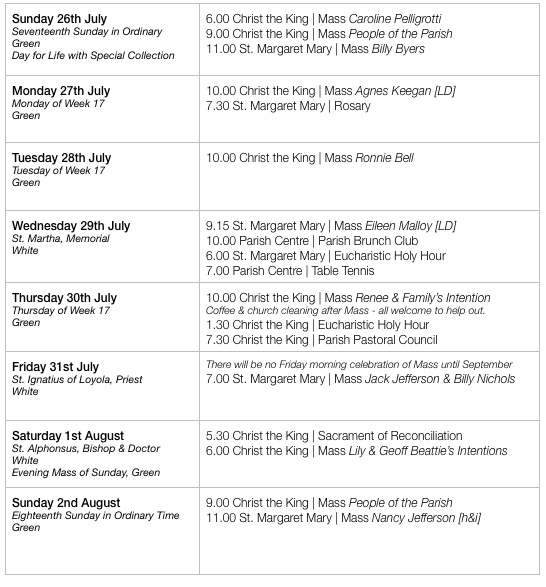 Please consider attending Holy Mass at some point during the week. Attendance on Tuesday and Friday evening is particularly poor - try to build it into your weekly routine to come and pray for family and friends or another worthy intention. We wish all our pupils and staff a happy summer holiday as the academic year draws to a close. We wish our Year 6, a successful transition to their new schools, The end of year Mass will be celebrated at St. Margaret Mary on Wednesday morning at 9.15 am. Parents are welcome to attend. Could members please inform Fr. Michael or Lyn Garbarino of their availability for Thursday, 23rd July at 7.30 pm, at Christ the King Presbytery. Thank you for your offering last weekend which totalled £751.24. Peter’s Pence was £130.89. Attendance was 240. Spaces are still available for the pilgrimage to Rome in May 2016. If you would like to go, please contact Gill at Tangney Tours on 01732 886666. So far 36 people have booked. On Wednesday mornings at St. Margaret Mary School 9.15 am - 11.30 am 50p per child. All parents and carers welcome - children welcome from birth. Refreshments and snack provide. No booking required. For more information, call Laura on 07551671522, or email: littlemoonbeams@hotmail.co.uk. Experience the beauty of the Lake District and support our diocesan Youth Service. The Manor is open for bookings from groups, individuals and families, 17–31 July & 2-10 August. B&B just £25 per adult; reduced rates for children and teenagers. For more information, or to book, please contact Gillian on 017687 72711. Classes continue on Wednesday 15th July at 5.15 pm in the parish room at Christ the King. The parish has received, this week, the sum of £8177.10 through the government’s Gift Aid scheme. We are able to claim back the tax paid by parishioners on the weekly donations they make. If you are a UK tax payer please seriously consider joining this scheme - all that is required from you is a signature [it’s as simple as that] and using the Gift Aid envelopes to make your donation. Contact Paul Daley at Christ the King and Richard Reardon at St. Margaret Mary for more information. All ladies in the parish are welcome to come along to St. Margaret Mary’s on Tuesday evening at 7.30 pm for a informal evening of ‘togetherness’ - this month’s theme is ‘Education is a funny business’. Thanks to all who attended on Thursday evening - the talks resume in September. Garden Party at St. Catherine’s Church, Penrith in the Haydock Centre & Grounds – Sunday 5th July 12 noon - 5.00 pm. Grand Draw - £200 must be won today! – Teas, Cakes, Books, Plants, beautiful Watercolours and lots more. All Welcome - Free Entry.